Bursting with strawberries, blueberries, raspberries and blackberries, this low sugar mixed berry bundt cake has a buttery taste with a hint of lemon. I used mixed frozen berries for this cake since I'm making this in February when fresh berries are expensive. I look forward to making it again in the summer when local strawberries and blueberries are abundant. Preheat the oven to 350 F. Grease and flour a 12-cup bundt pan. Set aside. In a large bowl, using an electric mixer, cream the butter until fluffy. Add the applesauce and continue to beat until incorporated. Mix in lemon zest and vanilla. Add the eggs one at a time, beating after each addition. Add the flour mixture to the butter mixture alternately with the buttermilk, in a few additions, mixing until blended. If using fresh berries, toss the berries with an additional 2 tablespoons of flour, and gently fold into batter. If using frozen berries, simply fold berries into the batter. Pour the batter into the prepared pan and smooth top. Bake for one hour, or until a toothpick inserted into the centre of the cake comes out clean. Cool the cake on a wire rack for about 20 minutes, then invert onto rack to cool completely. If you don't remember to take the eggs out of the fridge to bring them to room temperature, place them in a bowl of warm water for about 5 or 10 minutes. The frozen berries I used were a mix of strawberries, blueberries, blackberries and raspberries. You can use whatever is available in any combination to equal 2 cups. For a sweeter cake, replace the 1/2 cup of unsweetened applesauce in the Mildly Sweet recipe above with 1/2 cup sugar. Cream the sugar with the butter in step 3 and omit the unsweetened applesauce. 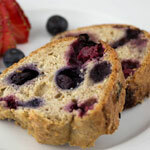 Adapted from: Bumbleberry Bundt Cake from foodnetwork.ca.